Do you ever wonder how you can be forgiven of your sins? Forgiven so completely that you are no longer guilty? God tells us how. 1. Confession is necessary if we wish God’s forgiveness. “I acknowledged my sin unto thee, and mine iniquity have I not hid. I said, I will confess my transgressions unto the Lord; and thou forgavest the iniquity of my sin” (Psalm 32:5). 2. Confession is to be made directly to God, the One who personally forgives. “I prayed unto the Lord my God, and made my confession” (Daniel 9:4). “But thou, when thou prayest, enter into thy closet, and when thou hast shut thy door, pray to thy Father which is in secret. After this manner therefore pray ye: Our Father which art in heaven, Hallowed be thy name. And forgive us our debts, as we forgive our debtors” (Matthew 6:6, 9, 12). 3. Jesus is our Priest—the only Mediator we need. “Wherefore, holy brethren, partakers of the heavenly calling, consider the Apostle and High Priest of our profession, Christ Jesus. Seeing then that we have a great high priest, that is passed into the heavens, Jesus the Son of God, let us hold fast our profession. For we have not an high priest which cannot be touched with the feeling of our infirmities; but was in all points tempted like as we are, yet without sin. Let us therefore come boldly unto the throne of grace, that we may obtain mercy, and find grace to help in time of need. And they truly were many priests, because they were not suffered to continue by reason of death: but this man, because he continueth ever, hath an unchangeable priesthood [which passeth not from one to another.] Wherefore he is able also to save them [evermore] . . . that come unto God by him, seeing he ever liveth to make intercession for them” (Hebrews 3:1; 4:14-16, 7:23-25). “For there is one God, and one mediator between God and men, the man Christ Jesus; who gave himself a ransom for all, to be testified in due time” (1 Timothy 2:5,6). 4. Confession and forgiveness accompany true baptism—the baptism of repentance and faith in Christ. “Then Peter said . . . Repent, and be baptized every one of you in the name of Jesus Christ for the remission of sins, and ye shall receive the gift of the Holy Ghost” (Acts 2:38). 5. 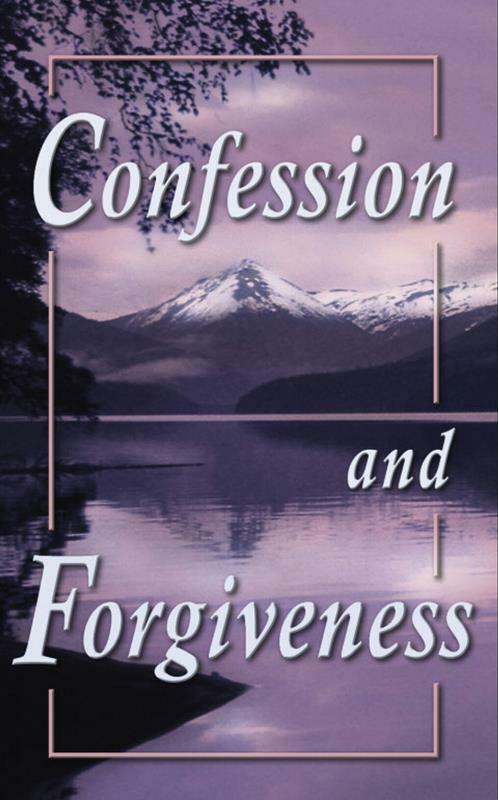 Confession and forgiveness sometimes accompany healing. “Is any sick among you? Let him call for the elders of the church; and let them pray over him, anointing him with oil in the name of the Lord: and the prayer of faith shall raise him up; and if he have committed sins, they shall be forgiven him. Confess your faults one to another, and pray one for another, that ye may be healed. The effectual fervent prayer of a righteous man availeth much” (James 5:14-16). “The Lord shall raise him up” “that ye may be healed”—the anointing spoken of is for the healing of the body, not the saving of the soul. It is to be called for by the Christian that he may become well, and not that he may become ready to die. “Call for the elders of the church”—more than one of them. “Let them pray over him”—again, emphasizing that there is to be more than one. “Confess your faults one to another” “pray one for another”—a two-way affair, Mary confessing to Jane, and Jane to Mary; John praying for Charles, and Charles for John. 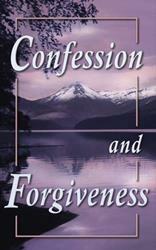 “If he have committed sins”—confession and forgiveness are only sometimes needed. 6. Confession brings forgiveness whenever a Christian sins. “If we say that we have fellowship with him, and walk in darkness, we lie, and do not the truth: but if we walk in the light, as he is in the light, we have fellowship one with another, and the blood of Jesus Christ his Son cleanseth us from all sin. If we say that we have no sin, we deceive ourselves, and the truth is not in us. If we confess our sins, he is faithful and just to forgive us our sins, and to cleanse us from all unrighteousness” (1 John 1:6-9). According to this Scripture, two extremes are to be avoided: (1) no one has the right to call himself a child of God if he continues to live in known sin; (2) none may claim sinless perfection. We must walk in the light of God’s Word as completely as possible, and with it be willing to confess humbly that we do fall short and sin at times. If against God, confess to Him; if against a person, confess to him; if against the church, confess before the church. 7. Restitution validates confession and forgiveness. Giving ourselves, our service, or our money to God is useless if we are unwilling to make things right with those we have wronged. Jesus said, “Therefore if thou bring thy gift to the altar, and there rememberest that thy brother hath ought against thee; leave there thy gift before the altar, and go thy way; first be reconciled to thy brother, and then come and offer thy gift” (Matthew 5:23, 24). Nor can we hope for God to forgive us if we are unwilling to forgive completely those who have wronged us. “For if ye forgive men their trespasses, neither will your father forgive your trespasses” (Matthew 6:14, 15). It is not that we earn diving forgiveness by forgiving our debtors. No, indeed. “While we were yet sinners, Christ died for us.” His blood was shed “for many for the remission of sins.” He made the first move. He forgave us long before we started forgiving others. He calls us to be merciful as He is, to show mercy to those who wrong us and desire our forgiveness.